Pike’s Place Market HDR (231/365 year 3) – Annoyingly Boring? 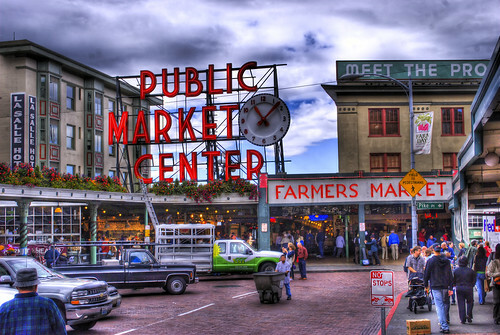 In keeping with the HDR theme I took this shot of the iconic Pike’s Place “Public Market Center” sign near the fish market and spun it through the magic HDR machine. I am super pleased with how this one came out. Pretty much makes up for the fact that I didn’t get any shots I was happy with of the guys throwing fish. These are amazing shots. Never heard of the HDR but it sure makes the photos look cool. Hope you are enjoying it here, or did. did. we were in WA from Thursday -> Tuesday. Had a blast. Need to go back! Gorgeous! Have you ever considered making notecard (CafePress) from some of your HDR images? This one, the hotel from Boston last year, the old timey theater, etc. Any with red or green or winter would make such original Christmas cards and I would get a dozen boxes! The HDR treatment is perfect here!